Chris read in the news that Medford had 0.0 rainfall during the month of September. Pretty cool! (Not so cool for the fires, but cool for me). It’s looking pretty empty in the garden after yesterday. After the shift in the weather, we decided it was time to “close down” the garden and bring in and put away the outdoor decorations, and furniture. We picked most of the remaining veggies, except for a couple of eggplant and some squash that can handle the weather, and pulled all the plants. 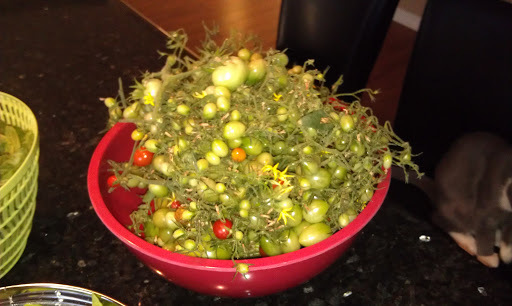 The last of the tomatoes, ripe or not, were picked and brought inside and we removed the tomato cages. 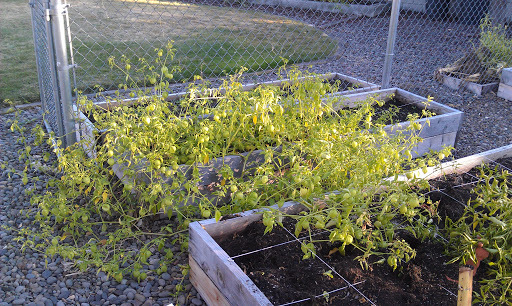 Tomatoes are so funny…they grow huge but cannot support themselves at all. Now they are all flopped over in a big heap! The first thing we worked on was the basil. We had about six plants, two huge ones and four medium size ones. I pulled them in the morning and let them dry off a bit and then we got to plucking. 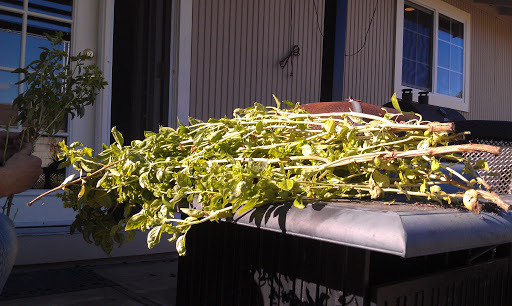 Plucking basil is a long and tedious job. 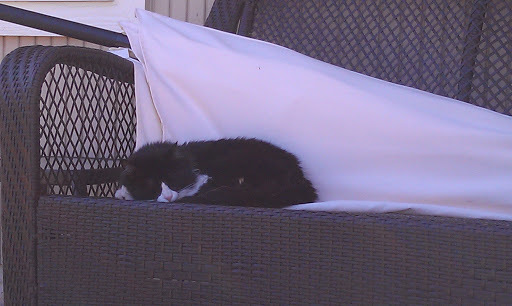 Even Roxie was bored with the whole thing. Three large colanders full of basil, ready to be cleaned and made into delicious pesto! Now, considering that one of those little 2 oz packages of basil at the store sells for something like $3 each, I just saved myself a gazillion dollars! Totally worth it. 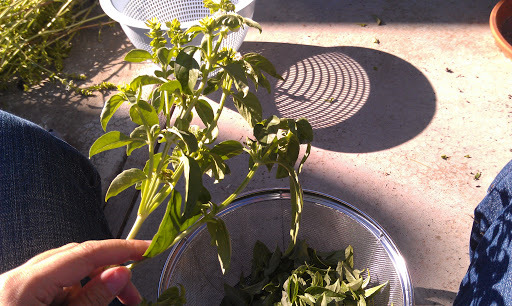 Plus, last night I used some of this fresh basil and made a quickie tomato basil soup from our tomatoes and basil. Super yummy! 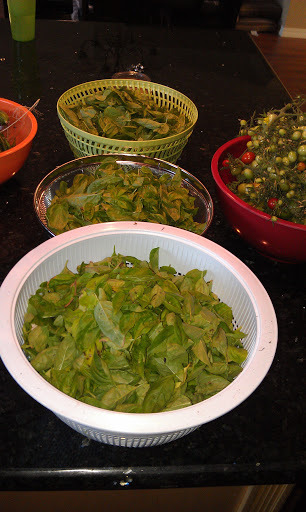 I could also dry the basil using my dehydrator and make my own dried basil rather than buying it, and I have heard that you can just wash, dry and freeze the leaves whole, though I have never tried that myself. 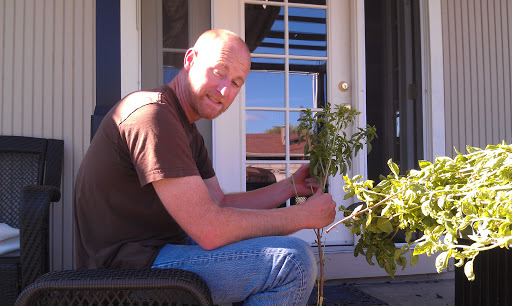 After the basil it was time to deal with the last of the tomatoes. 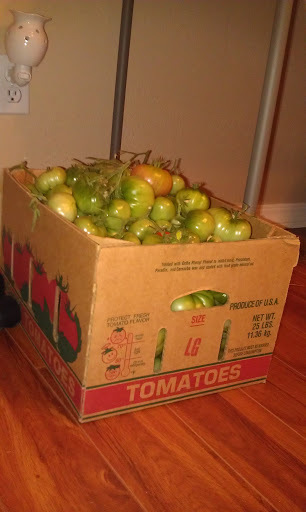 We already had picked most of the big ones and ended up with an entire box of tomatoes. Yesterday we picked the last of the grape tomatoes. Did you know that your tomatoes will eventually ripen, even if they are green when you pick them? They will. 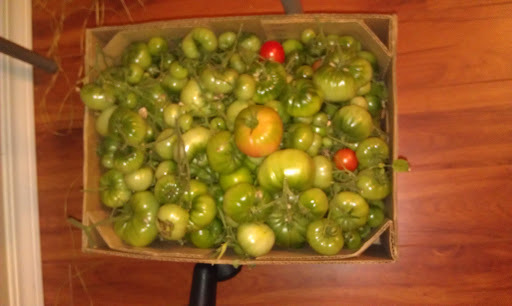 There were almost four cups worth of ripe tomatoes in the box last night. I have also heard that they will ripen even if you stick them in the freezer. Again, I’ve never tried this myself, but that’s the word on the Internet. Again, how much would I pay for all these tomatoes in the store? A lot! A little clam-shell container of grape tomatoes can be $4! Not to mention, I have been eating tomatoes almost every day for over a month now. Gardening is totally worth it! 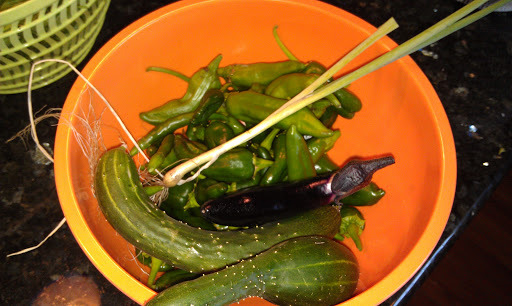 Next we moved on to the last of the peppers and other miscellaneous stuff, cucumbers, a random green onion, and an eggplant. Our eggplant is still going! It has more blooms and fruit on it. I decided not to pull it quite yet and just see how much more we can get off of it before the actual frost comes. Then it was on to the tomatillos. We use tomatillos to make a variety of things, but mostly a verde sauce that I freeze and then we use all winter for enchiladas, egg topping, I make a dressing by mixing the verde sauce with some plain yogurt, etc. This is ONE tomatillo plant. Remember, you can click on the pictures to see them larger in a new window. The only thing in this picture is the tomatillo. They get big and sprawl OUT. 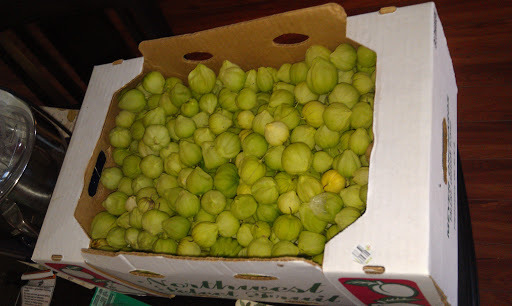 We had picked already about a half a box, but with what we picked yesterday we have almost a full box of tomatillos. Hello verde sauce! They aren’t as big as the ones in the stores, but again…how much would I have paid for an entire box of tomatillos?? 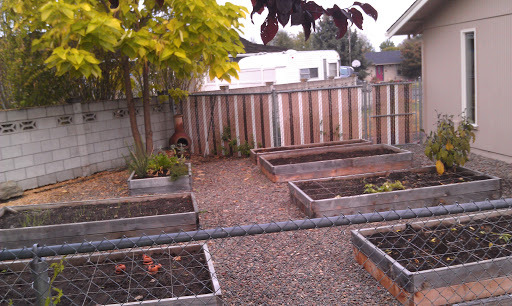 Having a garden is a lot of work. However, it is so rewarding to go out and eat fresh, clean, organic food from your own backyard and to be able to continue eating the fruits of your labor all year round by making different things, freezing and preserving it. 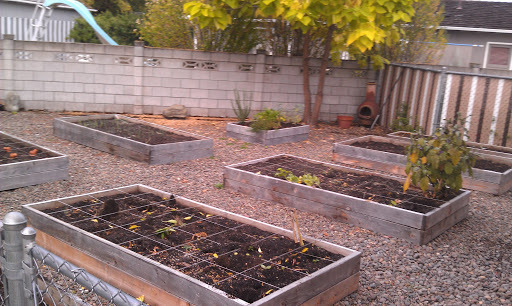 Our garden isn’t completely closed, we have garlic growing for next year, and I planted some greens and other fall/winter items that are sprouted and looking good. If the freeze holds off I might get some fall greens out of there, but if not the spinach at least might overwinter and be ready in the very early spring. We are already planning and prepping for next year! Do you grow any of your own food? Even a few herb plants can make a difference! Have you ever had a big garden?? What would be the most important thing for you to grow? For me: Tomatoes!! Hands down. 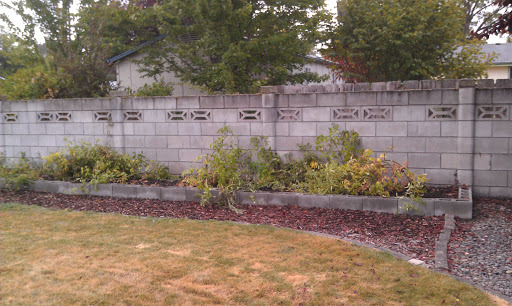 Even when I didn’t have a full garden I had tomato plants. 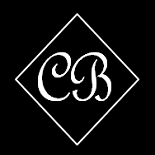 This entry was posted on October 14, 2012 by Corrie Beebe in garden.